The sad demise of Buffy has freed up space in the coop for one or two more hens. I was hoping that Winnie or Dottie would pop their clogs as they really are not very friendly, and haven’t laid for nearly two years. It’s always the way, the nicest hens die first! Today I picked up two little ex-battery ladies. So tiny compared with my big hens. They’ll stay for a few days in the little ark, then I’ll put the ark inside the hens’ run, then after another few days, I’ll let them all out together. It worked well when I introduced Buffy and Polly to the flock, let’s hope that it will this time. They don’t have names and I would be very grateful if you could suggest some please. 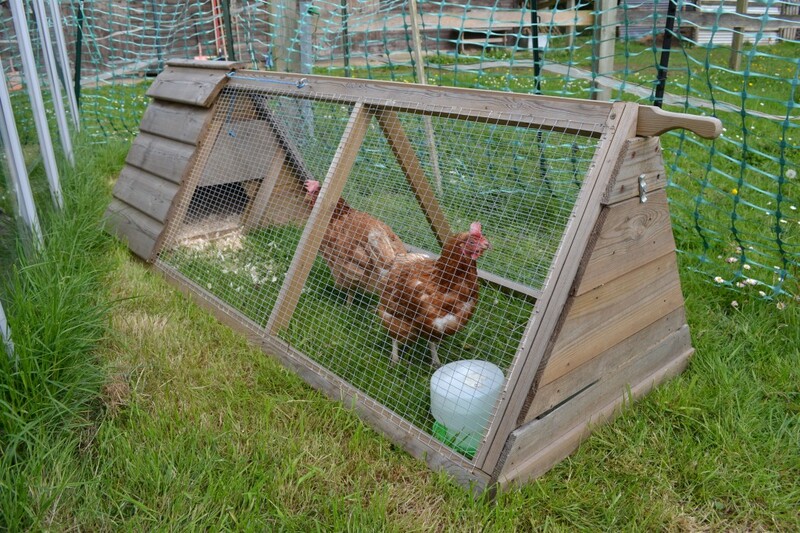 This entry was posted in Hens, Pets by Country lover. Bookmark the permalink. Hi Cathy, yes I had toyed with Tikka and Masala, or Tikka and Korma, but made me think of cooked chicken. A bit sadistic me thinks.. tee hee hee! I like old fashioned girls’ names. Have or have had, Polly, Buffy, Dottie, Winnie, Hettie, Rosie, Aggie and Betty. Thought Lottie might be quite nice. Though could go for Mavis, Doris, Edith…. Ermentrude… now that’s silly! It’s a cow’s name anyway! They are lovely – what about Ruby and Ginny? I also like your choices Lottie and Doris. Thanks so much Shelley for your comment. Ruby I like.. Oh it’s so difficult…. It must be soo difficult choosing names for babies, especially as there are usually two people who have to agree!! Hi Lynda, Have been meaning to leave a post for some time!! Just couldn’t resist this time. What about Maud and Matilda? We have just inherited a chook called Maud from some friends who have retired down to Adelaide. Will tell you more about her and lots of other news in an email which I promise to do this weekend!! Hi Gerry, thanks so much for your visit. Yes, like Maud and Matilda and Lottie and Gertie. Don’t know why I like names with ie on the end, makes them easier to talk to somehow. Maud would probably become Maudie and Matilda would probably become Mattie. I see that Marcia is suggesting Hattie… Had a Hettie, bit too close to that. Cats are Minnie and Maisie, I obviously have a thing about names ending in ie, oer. Lol! Look forward to your email. Like your reasoning Marcia! Had a lovely Maran called Hettie so Hattie is a bit close to that. Gerry suggested Maud and Matilda. Rather like Maudie and Mattie and Gertie as well, and Batty! Oh dear, I would have been hopeless had I had a baby, would never have been able to decide!! Thanks for visiting my blog, much appreciated! Hi Liz, like those. So the shortlist is: Batty, Scatty, Maudie, Mattie,Gertie and Lottie oh yes if I go for Batty the other should be Norah!! Oh dear, can’t decide. Perhaps best to live with them for a bit. Went for a long ride this morning. Thought, sod the weather, if I’m only going to ride on nice, warm days I’m not going to ride at all this summer!